My class this semester revolved around the idea of people, material artifacts, and information that are “born digital.” As my class blurb explains, “for people, this means that they are born into, and have only ever known, a world that prioritizes all forms of digitization; for materials and information, it means that they only exist in digital form.” After spending the first part of the semester discussing “Digital Natives” and how these “born digital” people navigate the digital world, we turned in the second unit to the concept of digital archiving. My inspiration for this class came in part from the Salman Rushdie exhibit at Emory University this fall, which showcased highlights from the Booker-prize winning author’s archive (housed at Emory), with a particular focus on the “born digital” aspects of his work. My students visited the exhibit, and I used their experience to get them thinking about and discussing the changes being wrought on institutions and people who work on processing, storing, and displaying information that only exists in digital form. 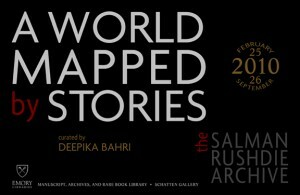 The assignment to visit Rushdie’s archives laid the groundwork for a series of assignments that culminated in the students creating their own digital archives. Using the “StoryCorps” model of interviewing a friend or family member to create an “oral history,” the assignment asked students to find a person at Georgia Tech or someone from the local Atlanta community who had an interesting and unique story to share (you can read the detailed assignment here). In groups, students conducted interviews with people including the current Georgia Tech Student Body President, the first woman elected sheriff in Georgia (a student’s great-grandmother), a Hurricane Katrina survivor, a campus legend, a fourth-generation Tech student, several Deans and Tech alumni, and a star Georgia Tech football player. The students researched their subject, developed questions, and conducted twenty minute interviews. They then edited those interviews down to 5-7 minute excerpts to create a distinct and concise central narrative (like the StoryCorps segments that air on NPR). Finally, the students uploaded the interviews to Georgia Tech’s digital archiving program SMARTech (Scholarly Materials and Research at Tech). You can go and listen to them here! The project, then, had some unexpected results, pushing students to think about their tendency as digital natives to depend on visual media to communicate and receive a message. But perhaps most significantly, students were asked to reflect on the value of oral histories and the potential of digital archiving to preserve and make available the narratives of ordinary people who have extraordinary stories to tell. And, in doing so, the students have left their own permanent digital legacy at Georgia Tech. Please go and listen to some of their stories and let me know what you think! Katy received her PhD in English with a certificate in Women's Studies from Emory University. Her work focuses on the relationship between 19th-century print culture and technology and the Victorian novel. She also writes about contemporary Neo-Victorian novels and Steampunk literature and culture. In both her teaching and her research she is very invested in the use of digital tools and in the broader applications of technology in the humanities. Tagged digital archives, interviews, oral communication, salman rushdie, SMARTech, StoryCorps, teaching.